An aspect of the course will cover the ways in which industry studies and utilizes components of the immune system from vaccines to making antibodies to measuring T-Cell Receptor (TCRs) repertoires as biomarkers. In the classes, bioinformatics methods will be used to to reinforce immunology concepts related to Antigen Receptor (AR), antibody and TCR, structure and function. A recent article (2), and discussions with colleagues, have also emphasized the importance of understanding how antigens interact with ARs because antibodies and TCRs recognize their antigens in very different ways. Antibodies bind soluble antigens without the aid of other molecules. These antigens can be proteins, or large molecules, floating in the blood or lymph. They can also be attached to cells or on the surface of bacteria and viruses. Soluble antigens can even be chemicals that are, or have been, previously bound to proteins. MHC-I with bound antigen. Left side - MHC "standing." Right side, rotated to show a top view. The bound peptide is highlighted and amino acids that are nearby are shown in space file mode. The amino terminal end of the peptide is colored red. TCR antigens on the other hand are small peptides that must be “presented” to TCRs by being bound to MHC (major histocompatibility complex) proteins. There are two kinds of MHC molecule, Class I and Class II. Class II MHC proteins get their peptides from extracellular sources and are generally involved in fighting infections. Class I MHC proteins present antigens that have a cellular origin and are most often involved in how self and non-self are recognized by the immune system. As an individual’s proteins are degraded, as part of normal function, the resulting peptide fragments will be displayed on their cells. When the immune system develops, the first peptides displayed are all self. These early peptides "educate" the immune system. Once we enter the world and are assaulted by germs, especially viruses, new peptides are created and are recognized as non-self. When TCRs bind to these antigens, the cells harboring them are killed. This is the fundamental mechanism of graft rejection and one way in which the body fights cancer. Neoantigens (new antigens) have always been present and for a long time we’ve known that the immune system plays a role in preventing cancer. However the concept of neoantigens (3, 4) as potential targets of immunotherapy did not fully develop until high throughput DNA sequencing systems became available and large surveys of cancer mutations could be studied. In cancer, many of the controls for maintaining a stable genome are lost causing a rapid accumulation of mutations. When these mutations alter proteins and those proteins are degraded and presented on tumor cells, via MHC-I molecules, they can be recognized as new peptides either because they are new through aberrant protein degradation, or are new through amino acid changes that make a peptide, previously recognized as self, appear as foreign. And, TCRs encountering such peptides will elicit cell killing. Indeed, evidence is emerging that cancers that have higher mutation rates can also lead to longer term survival rates presumably through increases in neoantigens and thier recognition by TCRs (5). How do peptides get to the MHC molecules? As the potential for neoantigen-related therapies increases, so does the need to better understand how peptides get loaded on to MHC-I proteins. 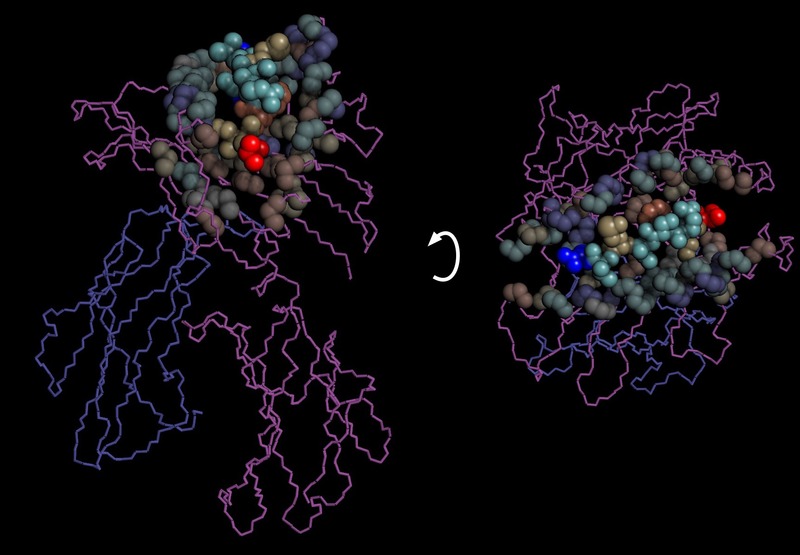 Toward this goal, Blees and collaborators recently worked out some of the details by solving the structure of the human MHC-I-peptide-loading-complex (PLC, 2). Adding a peptide to a molecule sounds easy, except for the fact that the peptide display must occur on the cell surface and protein degradation happens inside the cell. To move a peptide to the surface it must be pumped out of the cell (translocated) and subsequently captured by an MHC protein. This won’t work very well. Another way is for the MHC molecule to “find” the peptide inside the cell and then bring it to the surface which means the MHC has to be pushed through the cell membrane, also difficult. What if there were a way to have everything happen on the outside of the cell but do so inside the cell too? As it turns out, this is what happens; the peptides are added to MHC in the "inside out" part of cell, in the lumen of the endoplasmic reticulum (ER). The ER, being a membrane organelle that runs throughout cells, connects the inside world to the outside world much like our gut. 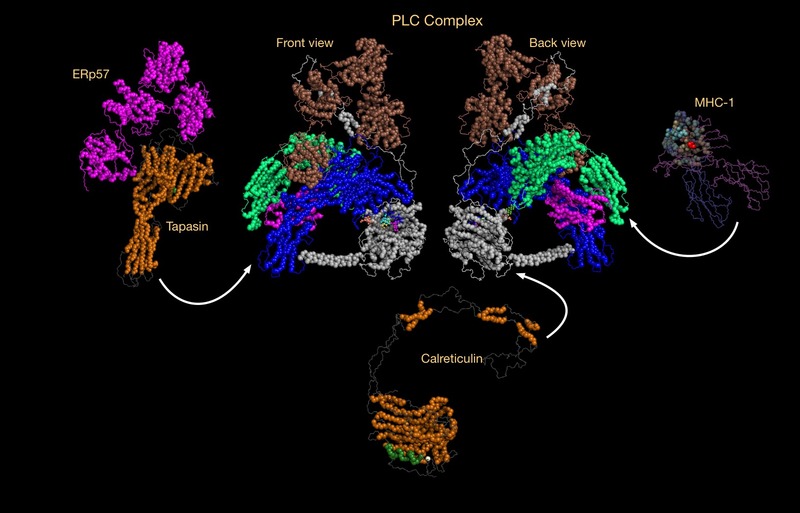 With the help of the peptide-loading complex (PLC) peptides are moved from the cytoplasm into the ER lumen where the PLC captures each peptide and places it on an MHC-I molecule. In this way the components of the system can bring the parts together and will not "float" away as they would in the extracelluar (outside) environment. Complex is an apt name for the PLC. It is a macromolecular assembly composed of seven protein subunits from five different proteins which are: the transporter associated with antigen processing (the TAP dimer, which consists of TAP1 and TAP2), an oxidoreductase (ERp57) with the chaperone tapasin, the MHC-I heterodimer, and another chaperonen, calreticulin. In this work, Blees and co-workers propose a model where calreticulin recruits a peptide receptive MHC-I molecule to create a fully formed complex with TAP. Next, TAP translocates a precursor peptide across the ER membrane (using one ATP) where it is added to a molecular basket, edited, and loaded onto the MHC-I molecule. After some proof reading by tapasin, the stable MHC-1-peptide then migrates to the Golgi and cell surface through existing membrane turnover processes. PLC - The complex is in the center with two representations to show the "front" and "back" of the complex. The component structures and shown with their names and arrows indicating where they are in the larger assembly. While the structure provides important insights, the detailed mechanism of peptide addition still remains a mystery, and the Nature’s News and Views about this article (6) indicates that other mechanism with related proteins may also be in play. What’s amazing is how much work goes into preparing and loading small peptides onto MHC-I molecules for TCR recognition. Blees A, Januliene D, Hofmann T, Koller N, Schmidt C, Trowitzsch S, Moeller A, Tampé R. Structure of the human MHC-I peptide-loading complex. Nature. 2017 Nov 23; 551(7681):525-528.